Jan Arnold has been singing since she was eleven years old, recording the songs of the time on an old Emerson reel to reel given to her by her parents. Jan grew up in the Upper Peninsula of Michigan, a remote, north woods area of the state, singing and playing the organ in church and for family, friends and social functions. At age 29, Jan began to perform professionally, playing guitar and singing in clubs while going to college to obtain a Bachelor of Science Degree in Music and Elementary Education from Northern Michigan University in Marquette, MI. Jan has traveled throughout the US including festivals in California, Colorado, Tennessee and Michigan. She has won vocal contests in California at the Crazy Horse Saloon, at Gilles in Nashville and also several in Michigan. Jan lived in Nashville for several years performing at the Ryman Auditorium, the Gospel portion of the Grand Ole Opry , which is featured immediately following the recorded show. She has been a special guest entertainer at the home of Tom T and Miss Dixie Hall for several years, the Tennessee State Fair and many other festivals. She has also been a guest performer on the Ernest Tubb Midnight Jamboree on WSM AM 650 and hosted her own "Jan Arnold Songwriters Show" at the Ernest Tubb Record Store on Saturday afternoons in downtown Nashville. 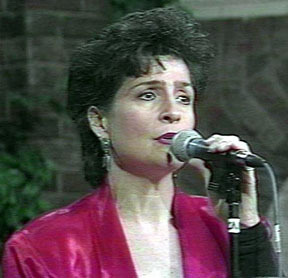 Jan has appeared on the national television show, "The Charlie Daniels Roundup", featured on TNN and has been a guest on many radio programs including WSM. She has been in the company of many stars and the opening act for the group "Hiroshima". Doug Supernaw - "She has an incredible voice." Blair Garner - (syndicated "After Midnight" Radio show) "You have a great voice, Jan."
Kristina Lynn - Hard Copy - "Jan is the Patsy Cline of the 90's." Bonnie Raitt - "Jan, Keep on singing those songs." Jan continues to delight the audiences with her talents and has recently been sponsored by local merchants to perform her shows at the Historic Calumet Theatre in northern Michigan. She has written, produced, directed and promoted her own shows as seen on ABC Network, WBKP Channel 5. Ticket sales continue to double each year and she continues to perform her shows at art centers and historic theaters throughout the mid west. Jan is a great entertainer, as well as a diverse vocalist and continues to present an incredibly entertaining show with "dynamic" vocals, superb musicianship, showmanship and humor. It is truly a SHOW you won't want to miss!